Strange Chrome Moly Steel Yokes are CNC-machined to exact tolerances and designed to incorporate 1350 Series U-joints (must-haves for drag racing and abusive street use). Not every 1350 Series yoke is the same. 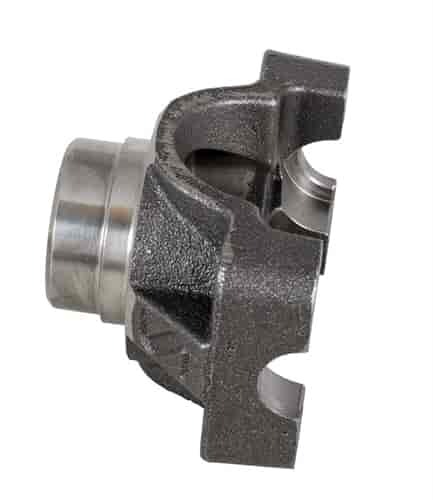 Many yoke manufacturers offer a Spicer Yoke that's remachined to 9" specifications for a 1350 Series U-joint. Although the Spicer offers a decent foundation, it does not approach the strength and fit of a Strange Chrome Moly Yoke. Strange S-Series Steel Yokes are ideal upgrades from smaller 1330 and 1310 Series OE steel yokes. S-Series Yokes are made to fit OE pinion supports, as well as Daytona-style pinion supports without yoke modification. The inclusion of a stamped steel dust shield makes this yoke the choice of street enthusiasts. Strange 2-Piece Couplers ease transmission maintenance and removal. They can be collapsed by removing the splined lock collar without disturbing the engine and rear ends. Through-hardened couplers are made of Hy-Tuf, and the aluminum lock collar is splined to provide maximum contact area. Specially heat-treated/case hardened 2-piece couplers also available for roller bearing extension housings. U1602 is rated 5.0 out of 5 by 1.